It occurred to me more than once, that the ConfigMgr Client Binaries, which are injected into the Boot-Image, don’t match the Version of my current ConfigMgr Environment. For example, on the Screenshot below, you can see that a Boot-Image currently has the ConfigMgr 1702 Binaries injected. However, the current Production Client is at Version 1710. After doing the ConfigMgr Upgrade from 1702 to 1710 in the past, I normally updated the Boot-Images as I always did, including ticking the “Reload this boot image with the current Windows PE…” Checkbox. So where exactly is this mismatch coming from? 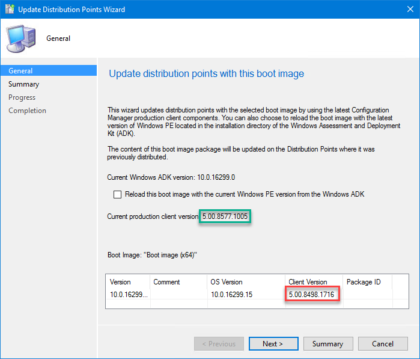 The Update Distribution Point Wizard always uses the current Production Client Version at the time of updating. I see most folks updating their Boot-Images directly after Upgrading ConfigMgr. At this time, the new Client Version often isn’t promoted to Production, so the older (previous) Client Version gets used. To prevent this from happening, you should remember to always update your Boot-Images, after promoting a new Client to production. This also applies to ConfigMgr Update Rollups / Hotfixes that are updating the Client. The second important thing to mention is, that the Client only gets updated when the Checkbox “Reload this boot image with the current Windows PE version” is ticked. To be fair, I never had any issues with older Client Binaries in my Boot-Images. However, as it is recommended to upgrade your Windows Clients to match the Site-Server Version, it should also be a good practice to make sure that your Boot-Images are up-to-date with the current ConfigMgr Client Binaries. Have uppgraded to CB1810 and when I try to update the Client Version in WinPE it doesn’t get updated. I check Reload this boot image with the current Windows PE… and run the guide. But afterwards the old version och Client is still there. Wonder if you have seen this and have any suggestions to solution. Good catch. Having just upgraded to 1810, we decided to do a 7 day pre-production client prior to promoting it to production, but we have been used to making new boot images right after upgrading SCCM. I’ll have to reload them and then run some scripts to add back in Dart remote viewer and crazy mouse fix, or else build new boot images after promoting the new client to production. I image that new client-related OSD features might be missing if running an old client in the boot images. Thank you so much! Exactly what I was looking for. I can’t figure out why my Boot Image wasn’t matching my current SCCM version.